We all have valuables that we would be devastated to lose in a fire. Some of them are keepsakes, some of them are worth a lot of money and some of them are important legal and business documents. Fireproof document storage is a major concern for individuals and companies, and there are a range of precautions that you can take to make sure that your valuable documents are protected at all times. 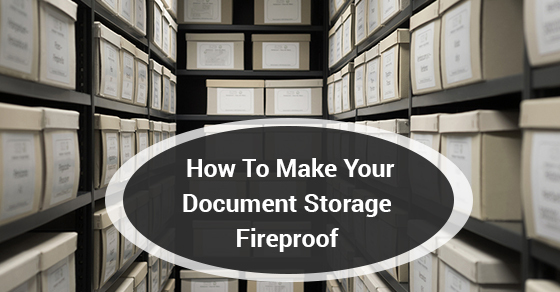 Below are four tips for fireproof document storage. Fireproof safes are designed to withstand blazes so that your important documents, cash, etc., survive. The one thing to note with a fireproof safe is that it is likely to get soaked with water, either because of the building’s sprinkler system, or when the fire department comes to put out the fire. It is wise when buying your safe to check that the safe is both fireproof and waterproof. Fireproof safes are tough, but they are not indestructible. If temperatures get high enough, even a fireproof safe is not going to be a fortified enough document storage option. Because of the nature of fire, and the fact that it generally spreads from the lowest part of your house to the highest, it is a good idea to keep the safe on the lowest level. That means either the ground floor or the basement if you have one. If you don’t have a fireproof safe, or feel that it simply isn’t necessary, items that are stored in the freezer, when the freezer is not in the kitchen, typically have a higher survival rate than anywhere else. If you have a chest freezer in a separate room, the basement or the garage, it might be wise to place any highly valuable documents in there. The freezer is often one of the last things to burn in a fire. If you are going away for an extended period of time and you have a self storage unit available, it might be wise to utilize your self storage space as document storage. The benefit of keeping your documents in a self storage unit is that the facility and your unit will be well looked after while you are not around. It’s the job of a self storage facility to ensure that their client’s belongings are looked after and protected against burglary and natural disaster. Consider investing in a self storage unit for an extra level of protection. A fire in the home or office is many people’s worst nightmare. While there isn’t much one can do besides call the fire department once a fire has erupted, the above methods and suggestions can help you protect your documents from fire damage and destruction.